Crooked teeth and noticeable gaps can be a drain on your self-confidence over time – so why not get rid of them for good? At Jacksonville Complete Dentistry, we’re proud to offer quality orthodontic care that can straighten your smile without requiring you to be chained to metal braces for years at a time. Instead, these aesthetic options create beautiful improvements in a natural and convenient fashion! Please contact us today if you have any questions for our team, or if you’re ready to schedule a consultation. Why Choose Jacksonville Complete Dentistry for Orthodontics? 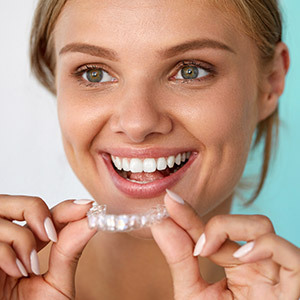 Instead of the typical wire-and-bracket model, Invisalign treatment has a modern approach to mild to moderate orthodontic problems – clear aligners! The patient will receive a customized set of these aligners, with each one representing a different stage of their smile’s changes. All you have to do is wear them as directed, only removing the aligner to eat, brush, and floss. This process is convenient, comfortable, and virtually unnoticeable to the people around you. 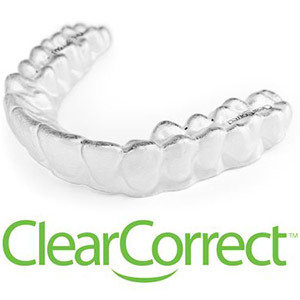 ClearCorrect is a clear aligner orthodontic system that is very similar to Invisalign and can be used to correct issues like overcrowding, gapped teeth, overbite, crossbite, and more. In many cases, though, it is somewhat more affordable than its counterpart. 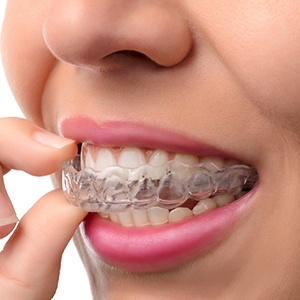 Patients will receive a custom-made set of clear aligners that fit subtly over their teeth, allowing them to maintain their regular appearance throughout treatment.